I have always been frugal and now being frugal and stylish is easy with the Savvycents wallet. A year ago, I read a really good financial planning book series that recommended using a cash budgeting system. Though I thought it was an excellent idea I was never able to incorporate it until I used the Savvycents wallet. 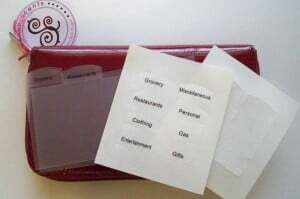 Savvycents wallets are designed with an accordion style filling system and pre-printed and customizable labels so that you can easily manage your cash system. 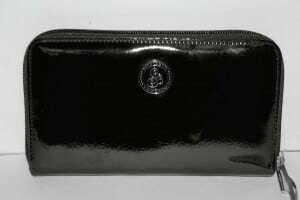 It also has a separate coin holder, six pockets for debit cards, a checkbook holder and a slot for a driver’s license. I like that the button snap feature keeps the accordion cash file area neatly in place. The Savvycents wallet zips closed to keep everything secure too. It is roomy without being bulky and the wallet measure 8”by 4”. 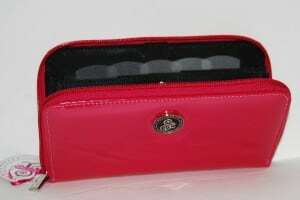 The Savvycents wallet is stylish and attractive and comes in fashionable red, pink or black. I really like my new Savvycents wallet. Once my weekly cash budget for groceries is empty then I know that I am done shopping for food for the week. It really helps me to stay on target and keep within our family budget. It also gives me a visual to let me know where our money is going. The Savvycents wallet is perfect for weekly/monthly cash budgeting systems. You can learn more about the Savvycents wallet by visiting their website. To purchase your Savvycents wallet or to get several as holiday gifts go to Savvycents and purchase for only $24.99. Joined you (follow you) on Blog Frog. I really like the Salsabol on Open Sky Store. It’s really neat and looks handy too. I may have to get one of those. Interesting post. Its agreeable reading how the extra secure feature of a zipper keeps your wallet essentials in place.